An implementation of granular synthesis in Max/MSP. 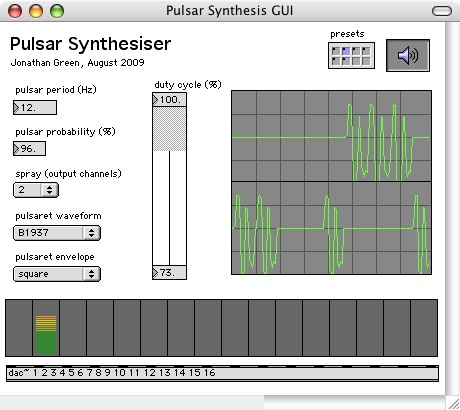 Pulsar synthesis is a type of granular synthesis whereby grains are ordered in time as a pulsar train. Varying the duty cycle of a pulsaret and its following silence, but maintaining the overall pulsar period gives an effect much like a band-pass filter. 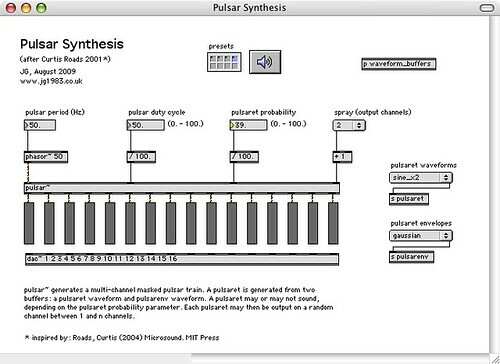 In this Max/MSP patch, all parameters are available: pulsar period, pulsar duty cycle, pulsar probability and “spray”. Pulsaret and pulsaret envelope waveforms are read from buffers allowing any arbitrary waveforms to be used. Pulsars are passed through a gate that can randomly turn each pulsar on or off, depending on the probability value. A “spray” parameter assigns each pulsar to a randomly selected output channel. The number of channels can be specified by the user. Processing is done entirely in the audio domain allowing high frequency pulsar trains. Roads (2001) suggests that transforming pulsar synthesis with convolution can lead to interesting sounds. Here is a quick example I tried.